There is no school on Friday, April 19 and on Monday, April 22. School resumes on Tuesday, April 23. Have a wonderful holiday, and enjoy your four-day weekend! Teacher and staff appreciation week is on Monday, May 6 through Friday, May 10. Please feel free to participate in any way you can. Let's show our appreciation for the hard work and dedication of the North Decatur Elementary School teachers and staff! Canvas is our school corporation’s learning management system. It is the platform we use to connect teachers and students digitally for announcements, assignments, quizzes, file sharing, and more. Be involved in your child’s education by becoming a parent observer in Canvas! To learn more about this platform, please view our parent Canvas information sheet. It will provide you with links to the app, PDF directions to sign-up a student, a video on how to sign-up a student, as well as instructions on how to use the app. Mark your calendar for our academic banquet on Thursday, May 23 at our central office. We will be honoring all of our students in 3rd through 6th grades for their academic accomplishments. All students that have been on the A or AB honor roll at least three of the four grading periods will be receiving an invitation. Watch for additional details coming soon. Mark your calendars for our annual Charger Car & Truck Show! This event is on Saturday, May 11, 2019, from 8:00 a.m. to 2:00 p.m. at North Decatur Elementary. Pre-register by May 1, 2019, for the $15 registration fee. Date of the event registration is $20. Dash plaques go to the first 50 registrations. Tractors are welcome also! For more information, please view our Charger Car & Truck Show flyer. To register, please fill out the registration form. For show and sponsorship information contact Dave Sell at (812) 663.9215. Please join us on Thursday, April 25 at 7:00 p.m. in the North Decatur High School gym for our 4th through 6th grade musical program. Students will need to report to the high school by 6:45 p.m. We are looking forward to a wonderful evening! Principal Rob Smith has announced the names of students attaining honor roll status at North Decatur Elementary, for the third grading period. Please view this honor roll list to view all the names. It takes hard work, dedication, and commitment to earn this accomplishment. Congratulations to all! Kindergarten registration was Thursday, March 28. If you were not able to make it to our registration, please stop by and get the forms and information needed to register your child. When visiting, please bring your child’s birth certificate and immunization records along with your child. Decatur County Community Schools online registration will occur from July 22 to July 26. Please find the registration link and instructions on our Registration page. The Decatur County United Fund Board of Directors recently awarded a $5,000 grant to the Decatur County Community School Corporation for the 2019 Camp Invention program. Camp Invention is a program of the National Inventors Hall of Fame, a nonprofit organization dedicated to advancing the future of innovation and science, technology, engineering, and math (STEM). Created 28 years ago to introduce children to the invention process, the camp encourages collaboration, entrepreneurship, and problem solving through innovation and STEM application. 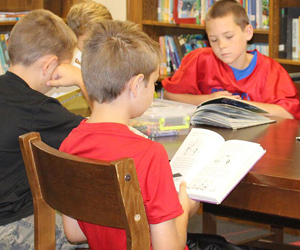 The program is open to any child entering kindergarten through sixth grade, regardless of school district, and will take place at the Decatur County Community Schools central office at 2020 North Montgomery Road on June 10-14, 2019, from 9:00 a.m. to 3:30 p.m. each day. Under the direction of Linda Smith, with staffing from fellow local educators, campers will explore technology while building confidence in their natural ability to dream and create. Please see our Camp Invention scholarship press release for additional details. 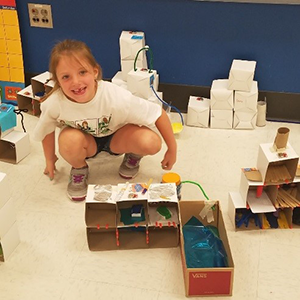 Camp Invention STEM camp is June 10–14, 2019, from 9:00 a.m. to 3:30 p.m. Camp Invention is for children entering kindergarten through sixth grade. Decatur County Community Schools Central Office is the location for this year’s camp. The cost of camp is $230.00 before the discount. The discounted rate for Decatur County students is $110.00. For information about this high-energy, hands-on STEM camp, please see our Camp Invention flyer. Stay updated with our regular newsletter. Get all the news from your child’s classroom here!